Even if you don’t work with PDF files too often, I’m sure you at least heard of Foxit Reader, the popular desktop PDF reader used by almost 300 million users. Now, the company has released a mobile version of their reader for the Windows Phone platform, which is definitely worth checking out. 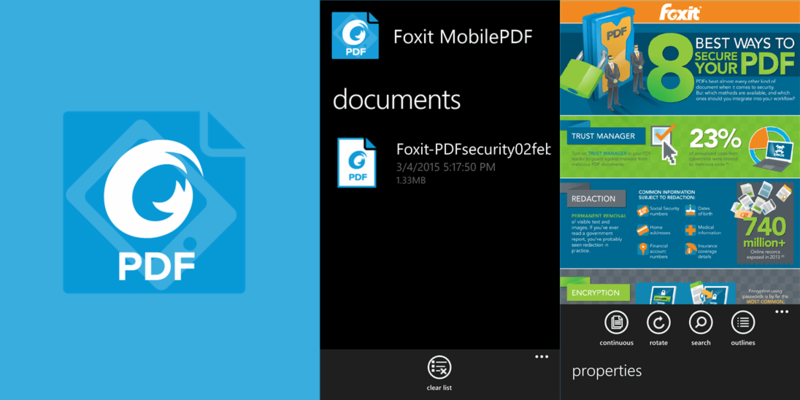 Foxit MobilePDF is free, with no ads or in-app purchases and hopefully it will stay that way. The app can render PDF files at high quality and keep them readable even on small screens. If you’ve been searching for a lightweight app you can use to read PDF documents on your phone, Foxit is about 4 MB in size and runs smoothly even on budget devices with only 512 MB of RAM. I’ve been testing the app on a Lumia 520 (you couldn’t get any lower than that, hardware-wise) and it moves flawlessly – no freezes or crashes whatsoever. I found it weird an SD card is included in the app’s official requirements. I installed it successfully on a Lumia 735 that had an SD card, but the 520 device didn’t, and the app worked just as well. The UI has a design similar to the Windows Phone OS, so it blends in really well. However, it doesn’t really bring anything new and unique to the table. At least its simplicity eases navigation and use, and it’s perfect for those with little or no technical experience. The layout offers three panes: one is for places, and here you can navigate through your phone’s folders and OneDrive account to find the PDF files you want to access. The documents pane shows you the recently opened files offering a quick way to re-access them. The last pane, called ‘others’ offers an ‘about us’ section and a ‘feedback’ option which is basically a shortcut to the app’s ‘Rate and Review’ section. Foxit MobilePDF lets you open PDF documents (including password protected ones) from your phone’s internal memory and SD card but also from OneDrive. 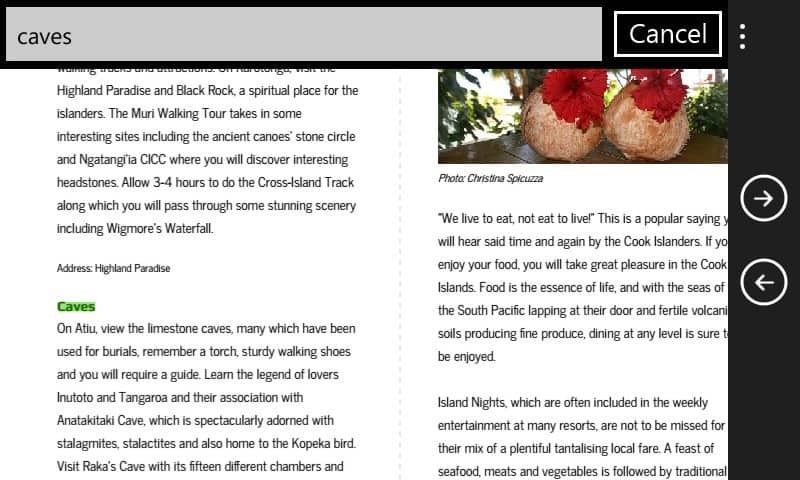 Once you open a document you can read it in Single Page, Continuous or Rotate View mode. 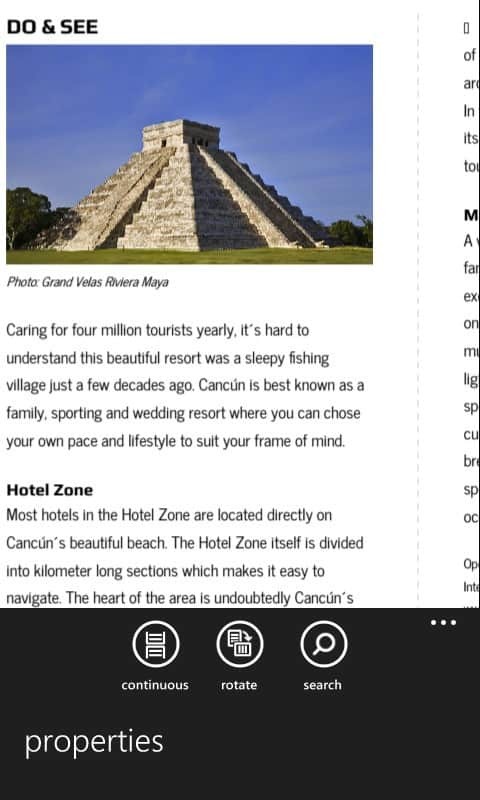 I personally enjoyed using Continuous, which is excellent if you like to read PDF documents in landscape mode. Scrolling and zooming in/out was smooth and you can also search for text inside the document if you need to. In the Application Bar you can access the documents properties and see information such as the file name, author, file size and the date of the last modification. Keep in mind the app is new in the Windows Phone Store, so its features are not exactly on par with the versions for iOS and Android, which have a plethora of additional features like more view modes, page jump, hyperlink support, annotation tools, bookmark support and file management options among others. It’s hard to be objective in this case, since Foxit Reader – the desktop application – is a really good PDF reader and their mobile apps for Android and iOS are as well. In the case of WP, Foxit Mobile PDF is a bit too basic for my taste at the moment, but if Foxit Software decided to develop an app for this platform, you can be sure it’s going to get a lot better. Morover, the app is available for both Windows Phone and Windows 8.1 and I can assume it will also support Windows 10 when the time comes. Hopefully, by then, Foxit MobilePDF will have more features and get on par with its Android and iOS counterparts. My advice? Give it a try, and even if you’re not impressed right now, it’s worth keeping it on your phone to get the updates and see how the app evolves. Follow us on Pinterest, Google+, Facebook and Twitter to receive our latest apps & game reviews, news, tips and how tos for Android, iOS and Windows Phone. You’re also welcome to join the Pocketmeta forums for some more mobile technology discussion!